Today their are so many things that contain dye. From the foods we eat, drinks, and wine. The worst of these can be kool-aid, gator aid, wine, make-up stains, and so on. 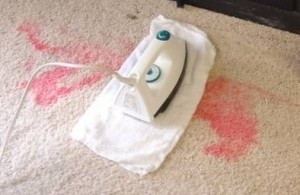 When these stains spill on the carpet they can immediately cause pernament staining. Their are no spotter products on the market that can remove dye. If you hire a professional carpet cleaning company to do a steam clean, a steam clean alone won't even remove the stain.You will need to request a Dye transfer kit that has a specific formulation that can remove the dye with a heat transfer. This will work with a lot of common dyes but not necessarily all dyes. Their are some dyes and even Indian inks that can be pernament. One of the things you can do to protect yours carpets is first buying a Stainmaster generation carpets that can protect from dye stains. Also after cleanings have dupont Teflon or Scothguard applied as this will help all the same.